What is it about certain foods? Why do some bring us positive feelings? Why do they remind us of home, even though we may not realize it, and they they may not even have any real ties to our homes? I started rolling these questions around a few weeks ago when I was in Amsterdam. My friend Kjell, was gracious enough to introduce me to Norwegian toasties, a type of sandwich that can best be described as a sort of Scandinavian Panini. It’s a three-tiered sandwich, bread, ham and cheese, bread, more ham and cheese, bread, with the occasional layer of butter, flavored mayo, and herbs. Then the entire sandwich is put into a shaped press and heated over the eye of the stovetop. The end result is nothing short of deliciousness, and it instantly made me wonder what else I had been missing out on in the way of Norwegian folk recipes. The very notion of “comfort food” is a relatively new one. The term itself was only formally recognized in Webster’s Dictionary in 1977. Every culture, though, has these. In America, it tends to be “Southern” foods. These are usually high in fat, but are so very satisfying to eat. In the UK bangers and mash (sausages and potatoes) and fish and chips come in handy as a natural mood elevator. In Japan, nobody makes miso soup quite the same way mom used to. Everybody, everywhere turns to something. However, I find it fascinating when one traditional comfort food, or foods, crosses cultures. For example, take Kjell. He’s from Norway, now living in Amsterdam, and he LOVES Paula Deen. At one point I thought it was because she was so different than anyone he would have encountered in his life. I thought maybe it was her personality that attracted him. Then, he started buying her cookbooks, and then he actually started cooking, and now I’ll have to admit he’s come a long way. He’s turning out to be quite the southern chef! Here’s a guy that lives on the other side of the world, cooking food from a culture he has no real experience with, and doing it well, and getting intense satisfaction and comfort out of it. It’s multiculturalism at its best. When the weather is grey, or I’m feeling down, I know there are certain things I turn to: meatloaf and chicken pot pie. I actually remember when I had this realization. I had a particularly rough day in my first year of law school, and in a year of bad days that’s saying a lot. I was driving home and it was pouring rain and the temperature was dropping. It had turned cold enough to be uncomfortable and to make me lethargic. I was sitting in traffic, feeling bad for myself, when I looked away from the red light and saw a Boston Market ahead of me. It had recently opened and I had never been to one before. 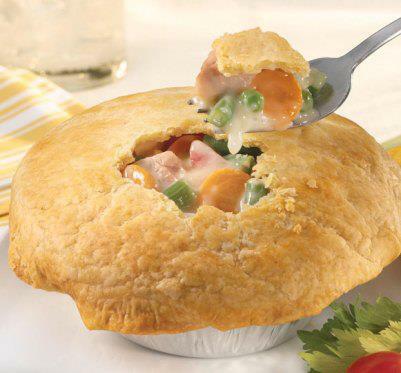 I pulled into the parking lot, and went inside, and after studying the menu, ordered a chicken pot pie. I took it to my apartment and soon I feel in love. Life didn’t seem quite so dour, and after the meat pie and a cold beer or three, I knew I’d return to fight another day. That’s the power of comfort foods. They can make the bad times seem less bleak, and they can raise the mood of the room. They can remind you of a home you may not have necessarily had, but the feelings they instill are no less real. Comfort, indeed.